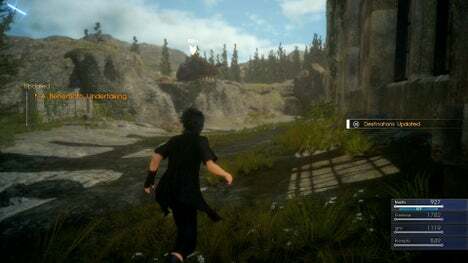 Welcome to Episode Duscae of Final Fantasy XV! 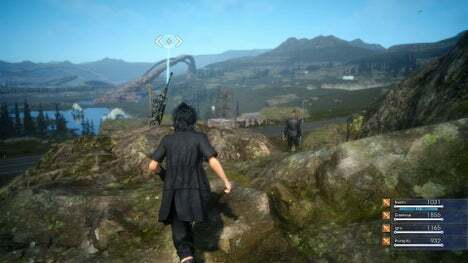 Here we get to see Noctis and his band travel across the land of Duscae while also exploring several parts of the game. This episode is the Alpha Release of Final Fantasy XV before they finally release the game of November 29, 2016. 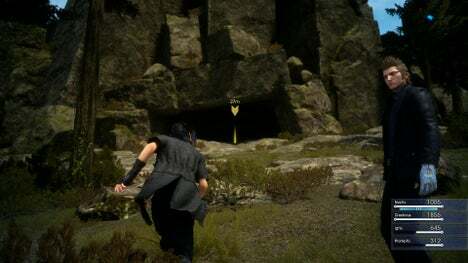 In the lands of Duscae, you’ll go through a cutscene which involves Noctis and the others waking up from camp. 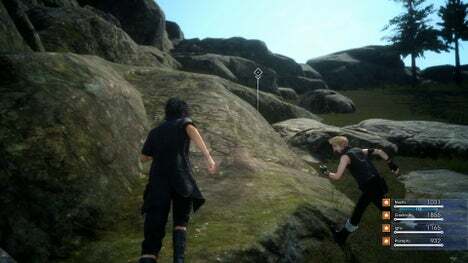 Here, you also learn each of their names: Prompto Argentum, Ignis Scientia, and Gladiolus Amicitia. They walk through the land and they tell you about the situation. Their car on getting to Cauthess broke down and they have to get it fixed. They left their car in the hands of Cindy but the repairs need at least 24,000 gil to cover everything. 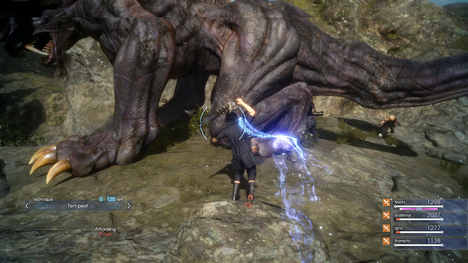 Gladiolus recommends that they go kill a Behemoth to get the horn and sell it. Quest triggered: Raise 24,000 gil to pay for their repairs. Quest triggered: Gather information about the behemoth. 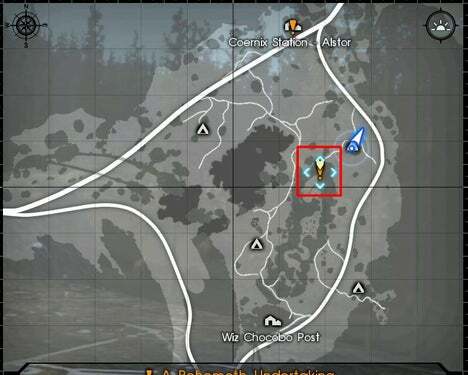 Walk towards the golden arrow and Prompto will prompt (lol) for you to check the golden arrow. There, you’ll find a board where you spot the request to slay the Behemoth for 25,000 gil. More than enough to pay for the repairs of the car. 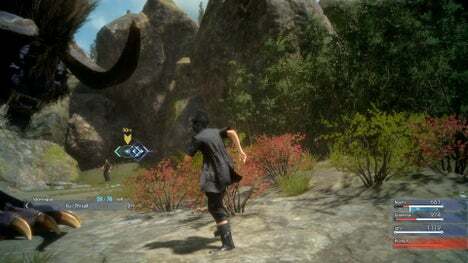 Before you go, Gladiolus can train you for combat. You can either go through the tutorial or not. After that, you’re ready to go after the Behemoth. But there are some things you should check out while in game. 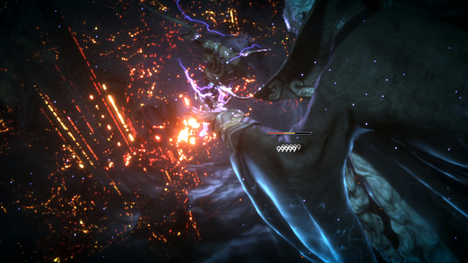 Deadeye is a Behemoth and the boss of Final Fantasy 15 Duscae Demo. You’ll fight this guy twice. The first time is when you stalk him, try to kill him, and fail. The second time is you stalk him again and armed with the Summon Ramuh, turn him into Swiss Cheese. When doing the Behemoth Quest, there will be six markers on the map. Each of these markers will signify a trail that leads to Deadeye. When these have all been searched, a new marker that appears leading toward his location. Before taking on Deadeye, wait until dawn, camp, and eat a good meal, then head to his lair entrance. There’ll be several battles but they’re not too important. But in case you blow your MP, there’s a tower nearby where you can warp to recover. Eventually, you’ll reach a stealth section where you’ll be tasked with following Deadeye through the mist. Despite his bad right eye, he’s quite effective at detecting you regardless of your angle of approach. The key to following him is to always stay at least several steps behind his tail and behind the line of sight of either eye, moving from rock to rock and taking cover. Your position in cover must still be out of line of sight with his head, or you will usually be detected. If he begins to grow wise to your approach, back off. Zigzag from boulder to boulder behind him and you’ll be fine. When you reach Deadeye’s arena, go over the plan with the team, and note the Warp Blade-friendly towers. Deadeye will be sleeping on a ledge. Note the tiny, ground level hole in the wall behind him on the right. You’ll be headed there at the end of this battle. Walk toward Deadeye at ground level, then teleport to the first tower when he moves toward you. Warp to the second tower and then the third near your allies. A QTE will begin. End the scene by teleporting when prompted. Deadeye will appear to fall, but its all a ruse. Soon a fierce, (and very difficult) battle will begin. Try not to get killed and work your way toward where you first woke Deadeye up. 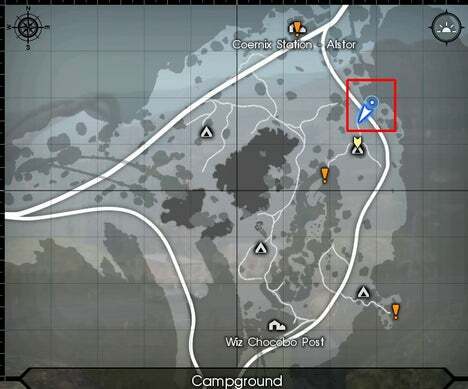 You’ll see an escape tunnel highlighted. Make a break for it, using blade warps if necessary. Once you’re through the gap, head off to the south to Wiz Chocobo Post and then head off to grind some more gil and do the other quests. After camping on your first day, there’s are weapons that’ll help you at the latter part of the game. 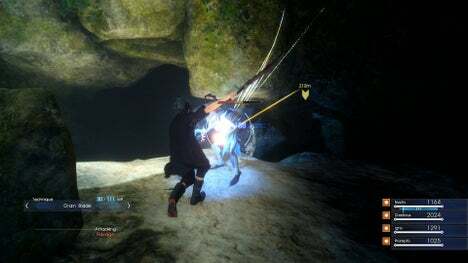 These weapons are known as the Relic Swords known as Armiger Weapons which trigger Noctis’ Armiger ability and would make life a whole lot easier. 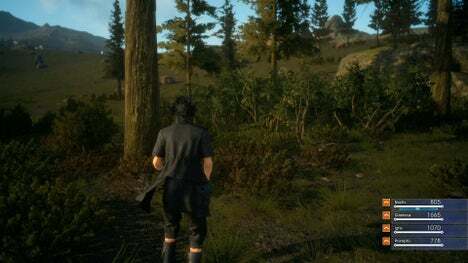 Once you collect the Relic Swords, Noctis will be able to use Armiger which casts Haste on him and has him summon four swords to attack. Head towards the red square just southeast of Coernix Station – Alstor. You can proceed along the marsh and the ridge above with minimal risk. Just don’t trouble the really big monsters nearby and the zerg; you’re not ready for it yet. Also, make sure you’re making this journey during the day. The nighttime monsters will overpower you at this stage of the game. 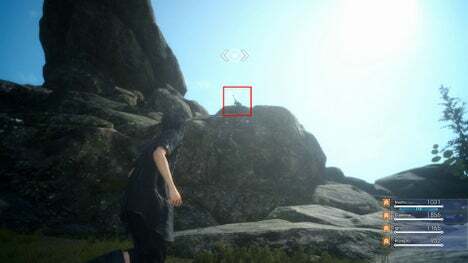 The relic sword you’re after is embedded at the top of this rock formation. Run up the low slop on the east face to reach it. Grab the hidden Dragon Scale on the way up. You can sell it for cash later. 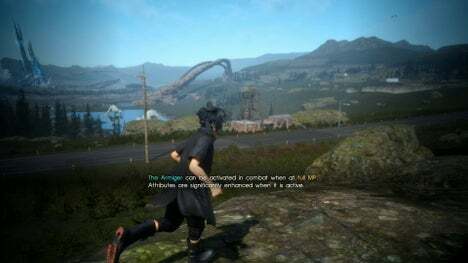 Grabbing the sword activates your Armiger ability. When you have full MP in combat, you can press both bumpers (or L1 +R1) to activate a hyperactive combat mode where you move much more quickly, bounce from enemy to enemy, and deal additional damage. It’s extremely effective against most foes, and will help a lot on the next stage of your quest. 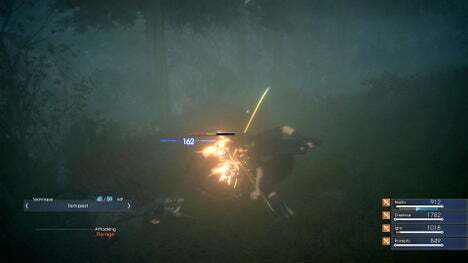 Getting the third Armiger Weapon is the more annoying one among the swords. 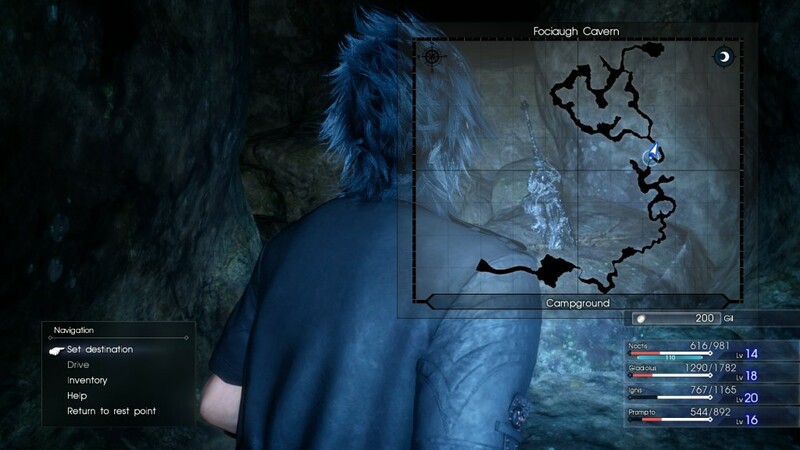 The heirloom is located in the Fociaugh Cavern, which is on the southeast area of the map. Before heading towards the cavern, get used to the battle functions. 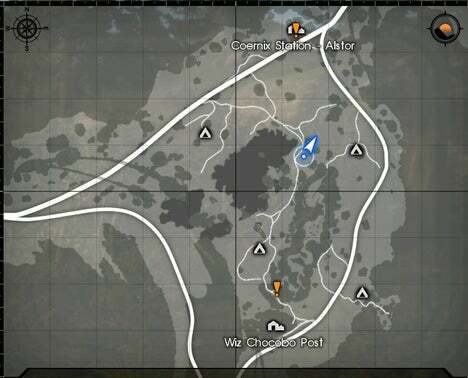 Grind a bit, earn a few gil here and there. Make sure you buy enough potions and antidotes. Also, if you haven’t gotten the second weapon, check the guide above how to get it. 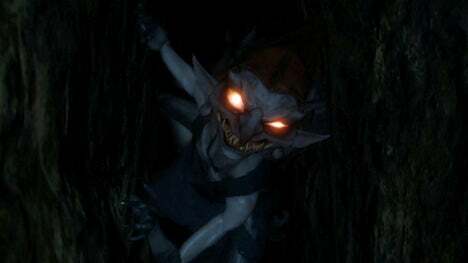 Inside of the cave, you will get swarmed and surrounded by a bunch of goblins that can inflict poison. And that could be really annoying, especially since it will drain your health down to one health point if you don’t use an antidote. These fights are easily the toughest in the game (aside from fighting Behemoth normally), so make sure you are well leveled and stocked before entering the caves. 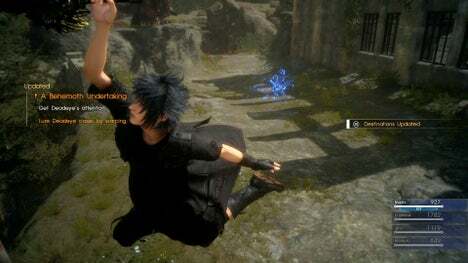 If you are still having trouble, you can try spamming your Armiger abilities.Warp Strikes make Noctis slippery so it’s easy for him to move around and not take too much damage. However, you do have a limit which is your MP. But don’t worry too much about your MP. Because of Warp Strike, you can run away at a safe distance to get it slowly back up again and let your other party members take care of the goblins. Of course, make sure you help your companions once their HP reaches zero or else you will lose them for the entire fight. Fortunately, the heirloom will literally be right in front of the vision. Squeeze through the tiny passageway and you’ll be able to grab the blade. 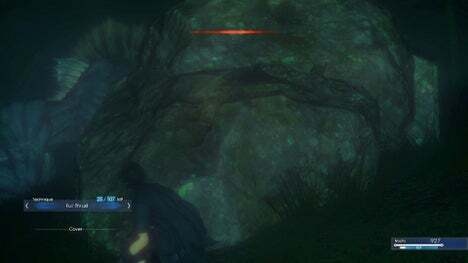 After that, make sure you keep going into the deepest chamber in order to acquire the Ramuh summon, which will make getting the next sword so much easier. You earn Rhongomyniad, after beating the Deadeye Behemoth for the first time. 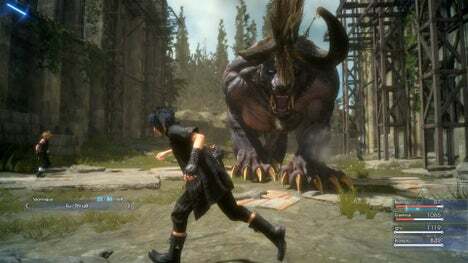 Hunting down the gigantic beast is the main quest of Final Fantasy XV Episode Duscae. After you tracked his lair, you’re going to have to fight him. With the Ramuh summon, however, you can simply let your HP drop to zero and then hold the X button on DualShock 4 or the A button Xbox One Wireless Controller when prompted to summon Ramuh. Doing so will end the fight in a timely matter. Of course, you can also choose to fight the Behemoth the normal way although that method will take a lot more time. 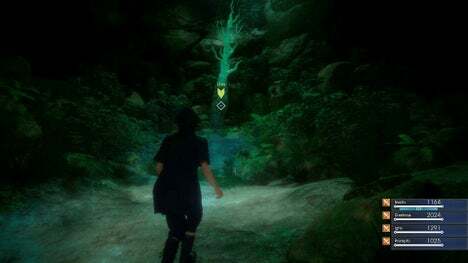 While going through the forest, you’ll stumble over a sidequest. 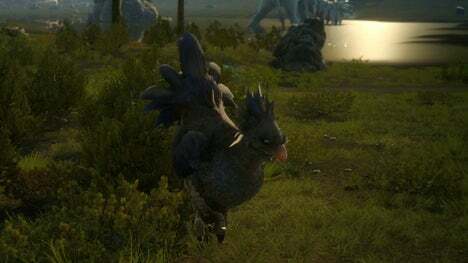 This sidequest requires you to find a Black Chocobo. To successfully complete the quest, head over to the location. Nearby you will see a dense thicket. Jump into it and flush out the Black Chocobo. Ta-da! 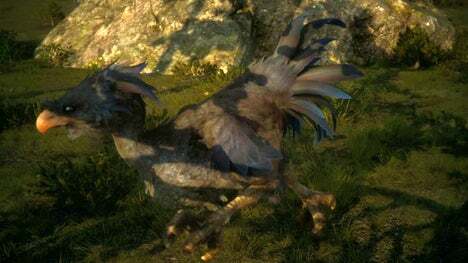 You finished the Chocobo quest! The demo in Episode Duscae also books you a trip to goblin-infested caverns. 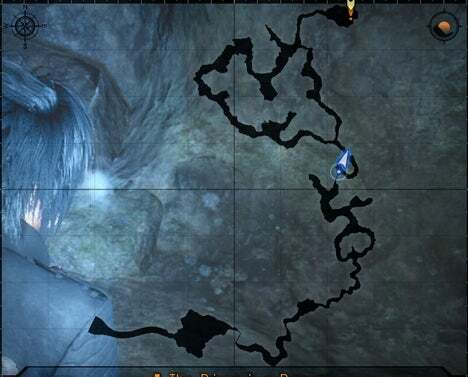 After visiting Wiz Chocobo Post, players should head northeast to Fociaugh Cavern. In this cave, you’ll find the valuable Ramuh Summon. Foclaugh Cavern is hard for a reason. That reason? A zerg of troublesome Goblins. While a single Goblin is no threat at all, be careful when they attack as a zerg. They can eat through your HP by throwing poison flasks at you. This is why before you head into the caverns, make sure you’ve stocked up on potions and antidotes. 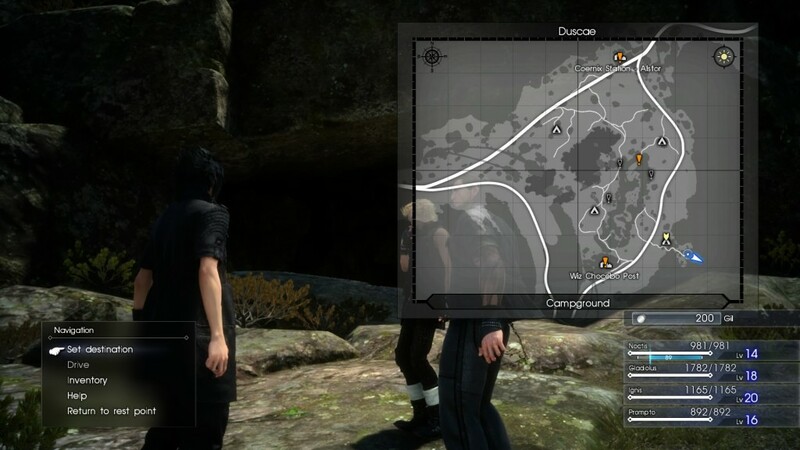 Before going in, make sure you have the Armiger Weapons. It’ll help you take out the big clumps of goblins coming in. Stock up on potions and antidotes to keep yourselves alive while down in the caverns. And most of all, sell the trinkets you’ve found throughout your journey at the Wiz Chocobo Post store. While in the caverns, clumps of goblins are going to start attacking you out of nowhere. Take them out as fast as you can. Use Armiger if needed. If poisoned, throw in an Antidote or two. And to make sure they’re still standing, give your allies a potion to keep them going. 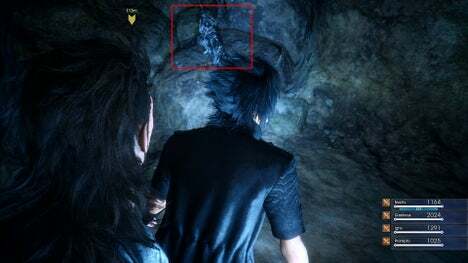 About half-way through the cavern, (and just about where you see the Blue arrow above) you’ll encounter a narrow crack in the wall. Be alert! When you begin to move in, a mess of Goblins will pour out. Watch your characters’ status bars carefully and apply potions and antidotes liberally. Activate Armiger early. Just after the Goblin rush, you’ll encounter a relic weapon embedded in a stone. Deeper in the cavern, one of your party members will rush ahead. When you catch up with him, a second horde of goblins rush in. Take them out quickly. This time, there are Warp-points available above this fight to hang and recover if you need to. After the final push of goblins, you’ll follow the path to this chamber. Touch the branch to gain your first summon ability and exit the cavern. Now it’s time to find Deadeye. After acquiring the Ramuh Summon, return to the arena through the same hole you used to escape. 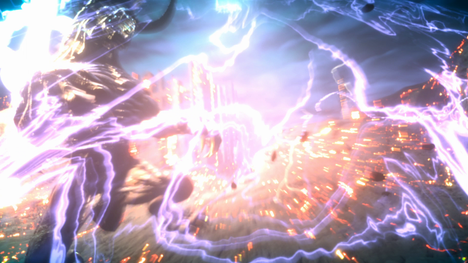 You’ll be able to take on Deadeye again.Time to pummel Episode Duscae’s big baddie into submission and get that horn. After fighting those Goblins, battling should be a lot easier now. If you still have those left-over potions you have from facing the goblins then, sustaining shouldn’t be hard. Use your size. You’re smaller so zip around him and smack his hind leg. After finishing off Deadeye, head off to a store and sell the horn for 25,000 gil. With that, you can go get your car fixed. Then, congratulations! You just finished Episode Duscae!